Play Chess Like the Pros. Type: BOOKS. Detail: Gormally, D. Product Code: 9781857446272. What separates the greatest chess players from mere mortals? Grandmaster Danny Gormally believes that understanding, preparation and will to win are three crucial factors. In Play Chess Like the Pros he examines these key aspects and attempts to bridge the gap between the best and the rest. He believes that a player's capacity to improve is limitless, and in this age of computerassisted learning the opportunity to do so is greater than ever before. But are you prepared to stretch yourself, to take yourself out of the comfort zone? However, this is more than a selfimprovement book. 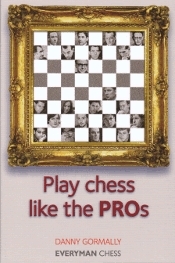 Nearly 15 years of experience as a chess professional makes the author ideally placed to tell the stories, not just behind the moves but also the characters who play them, giving the reader an insider's view of professional chess in the modern age.